Like the weatherman predicted, it was 37 and raining. I don’t know what it was with the windchill but it was definitely more freezing rain and it was cold. But not cold enough for the mud to be frozen. Horse people, you know the misery I’m describing. 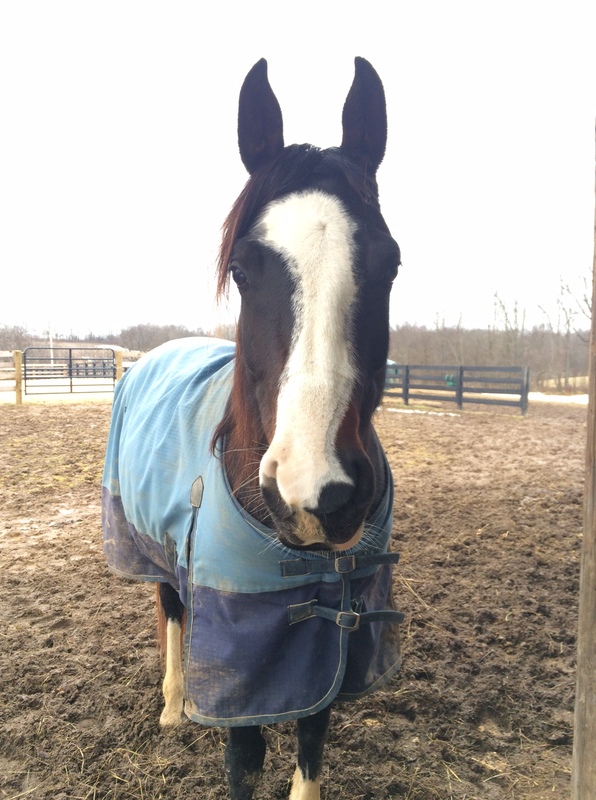 Nibbles lives outside 24/7 – the barn we have has a tack room and place for hay but no stalls. 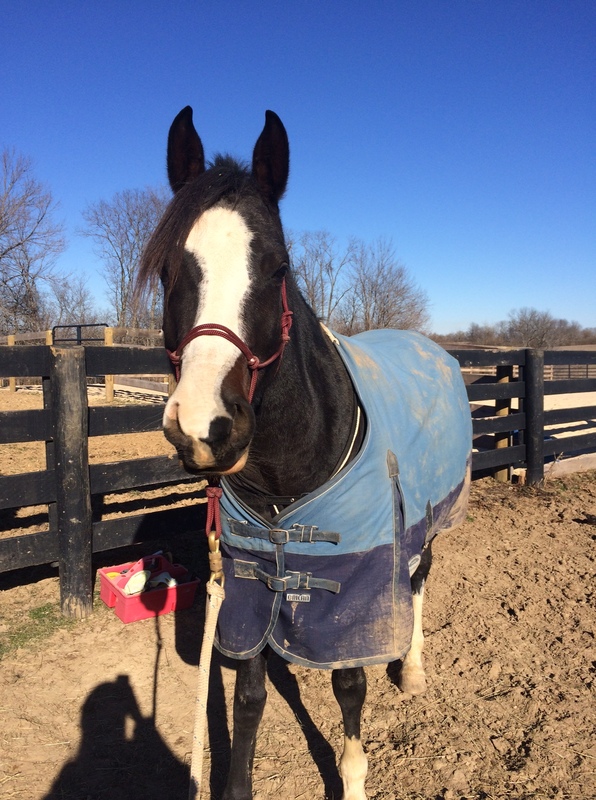 So I pulled up my hood, grabbed a halter, and slid through the mud. Luckily, wee mare was nearby so I didn’t have to go far. Note the ears and half stink eye. 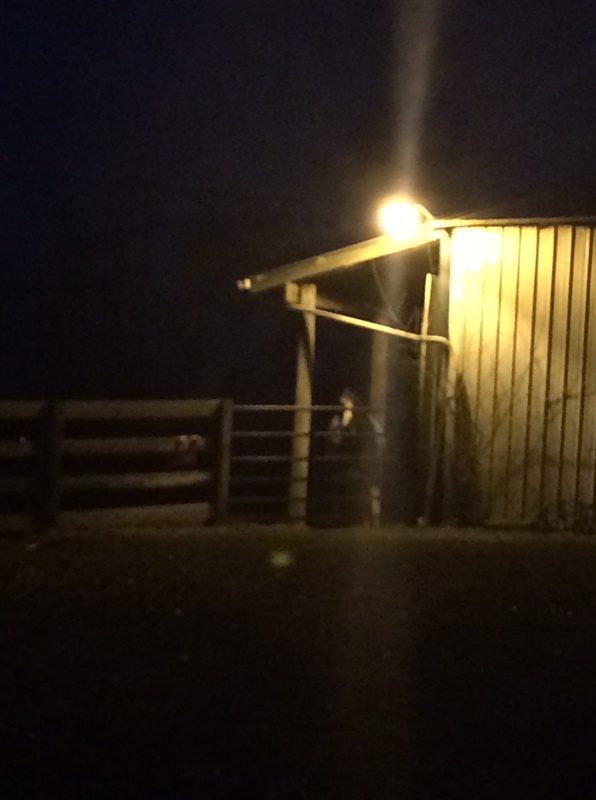 I quickly realized we were going to be worried that we couldn’t see our friends from inside the barn. I did not have 100% of her focus. Plus the rain hitting the metal roof makes a super horse-friendly sound. Sigh. I mentioned making sure she had buttons installed before she goes to the trainer. Not panicking when she’s away from buddies is not installed yet. She didn’t actually do anything naughty so much as fidget and try to turn around. But still, the anxiety was definitely there. So I made her stand tied for 5 minutes. Like she could not move one hoof. She had a pile of hay she could just put her head down and eat but she chose not to. Silly but I wanted to start small. After that, I moved her outdoors where she could munch hay, her buddies could potentially be in view, but she still had to stay with me. Her buddies were out of sight but it was remarkable how much more relaxed she was. Fifteen minutes was nothing. I’m still kind of worried, though. In the end, she was separated for half an hour. She was definitely better at the end than at the beginning. Hopefully she’ll improve each time. We have to start somewhere, right? 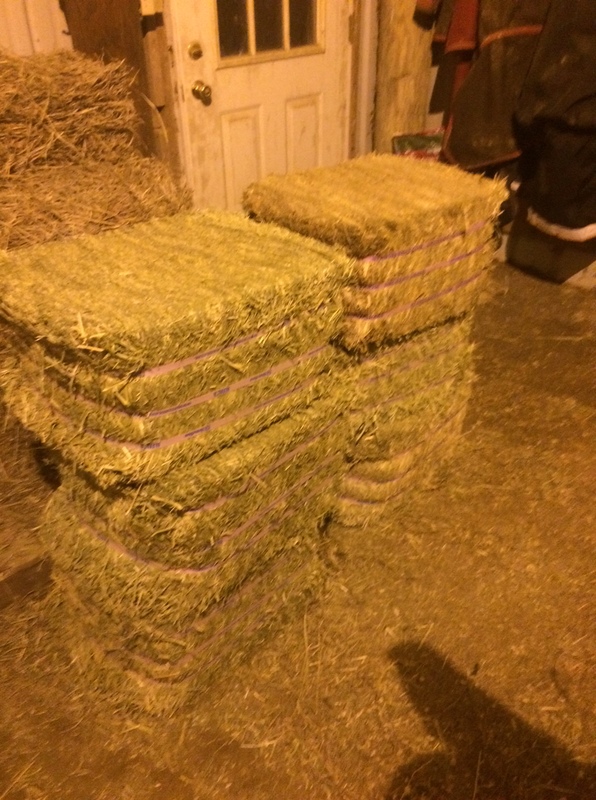 By a happy circumstance, I acquired several compressed bales of Standlee hay. 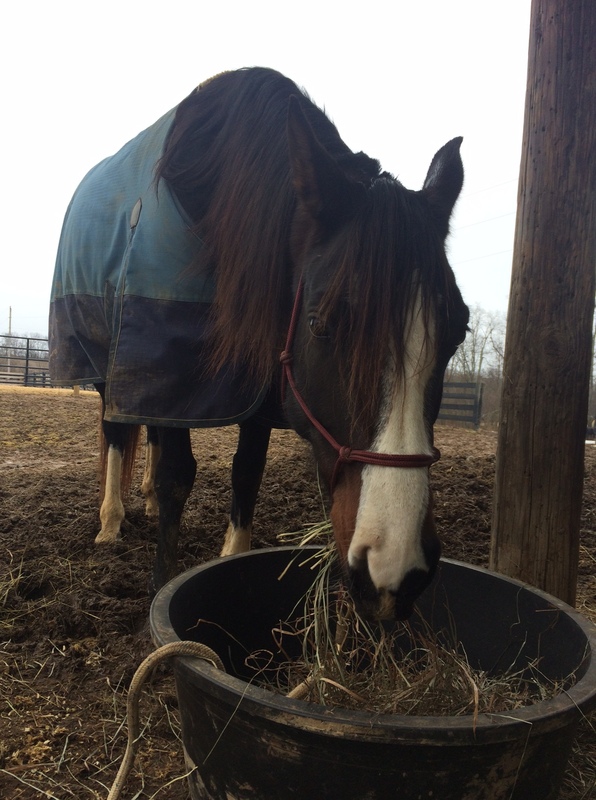 If you’re not familiar with them, Standlee grows some really quality forages and I’ve been wanting to see what the horses think. I was able to get five bales of straight alfalfa and one orchardgrass. It doesn’t sound like much but these are compressed, 50 pound bales so they actually last a lot longer than you think. 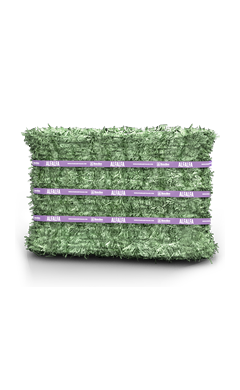 They compress a 4’x4’x8′ bale into something roughly 2′. In a stroke of brilliance, I conned asked my fiancé to load up the bales into my car during my lunch yesterday. He was pretty much cursing my name by the time he was done. 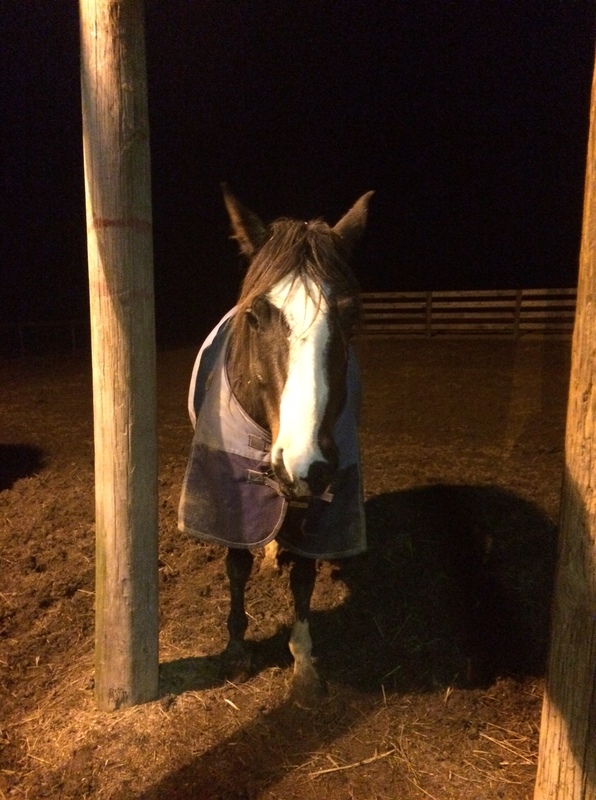 It hit me that I had to go to the barn alone after work in the dark. And I couldn’t pull my car up to the barn to unload because of the mud. Did I mention the barn sits at the top of the hill? Not my brightest moment. But unload all six bales myself up the hill and stack them I did. Don’t let those suckers fool you – they’re heavy! I was pretty gassed. The horses were unimpressed with me flinging the bales as soon as I got them into the barn. Needless to say, it was pitch black before I even got everything unloaded so there was no work able to be done. I decided to just grab some cookies and go hang out with Nibbles. Hello cookie lady. You haz cookies for me? Nibbles is so loveable, it’s almost silly. 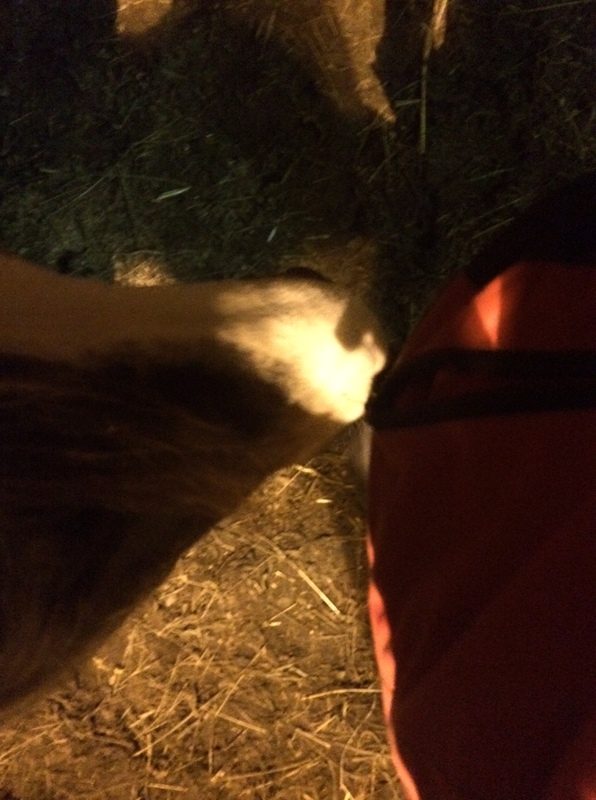 She immediately came up from scratches and started gently “nibbling” my pockets for treats. How can I resist that? I can never just give her cookies so I made her stretch and played with her tongue and lips. The things I do to my horses, I must look like a lunatic. When she had her two cookies, I started working on her mane. In 48 hours, she can build a witch’s knot like nobody’s business. So while I did that, she took to grooming me… by licking my ski pants. And we’re not talking a couple of licks… she spent 5+ minutes continually licking. Okaaayyy pony. A pretty pointless visit but at least I think she likes me, right? Winter, you can go away now. I need daylight and warmth. Nibbles is a lot of fun. One minute, she’s dozing while you groom her. The next, she zooms around like she’s got places to be and energy to burn. Then she checks back in like “That was fun. How about some scratches?” On Saturday, I went out with the purpose of removing her from friends and grooming her. She’s a fairly “herd sensitive” horse. I wouldn’t call her herd bound but she does take a lot of confidence from her herd. So my goal was to establish that, oh yeah, good things happen when the human takes me away. We started with a grooming session. The weather had been in the 50’s earlier that day so no one had their blankets on and she had mud in her eyelashes. She snoozed and I still had daylight so I decided to turn her loose in the arena and see what we had. Walking and smelling turned into zoomy trots turned into WHEEE! After desert racehorse had some fun, I caught her eye and she came over without a fuss. That was fun but also a lot of work. Even when she plays, I love being able to keep her brain. 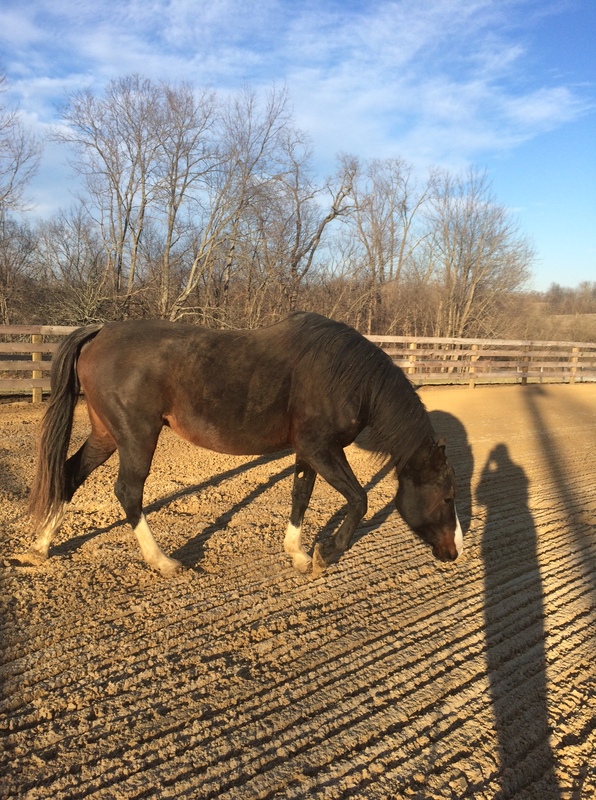 The proof came when her pasture mates decided it was time to zoom all around the very muddy, slippery field. I stopped what we were doing and caught Nibbles to go calm the herd. The last thing I want is someone else’s horse to slip and fall. In particular, one mare was very worried and flying around in a way that threw caution to the wind. So I haltered Nibbles and took her back into the now-galloping pasture. Nibbles watched all of her buddies zoom around and, eventually, two of them stopped. This happened in a matter of 30 seconds maybe? However, two of the mares still had the willies. To try to catch them, I turned Nibbles loose. She yawned and then followed me around with her nose hanging while I calmed the rest. 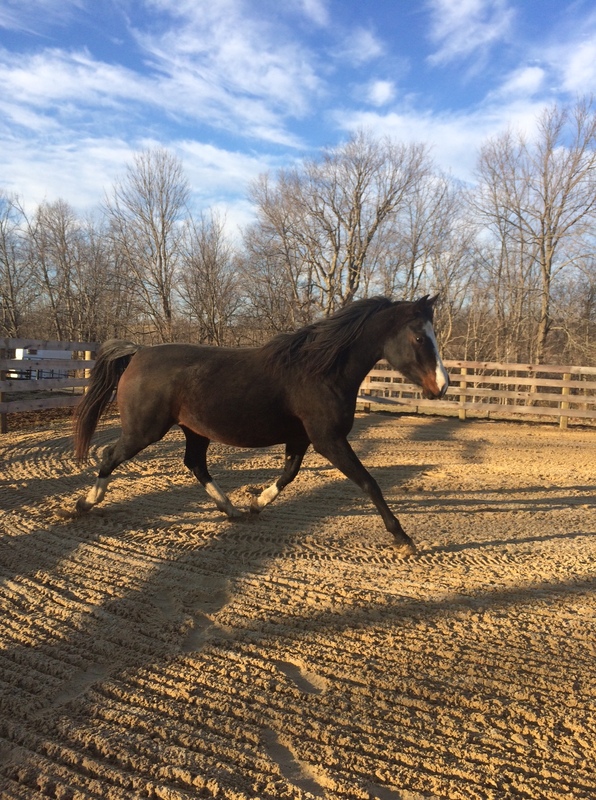 My wild Arabian could have cared less that her pasture mates weren’t sure the sky wasn’t falling. Love her brain and when she really focuses on me and trusts me! I’m headed out tonight. 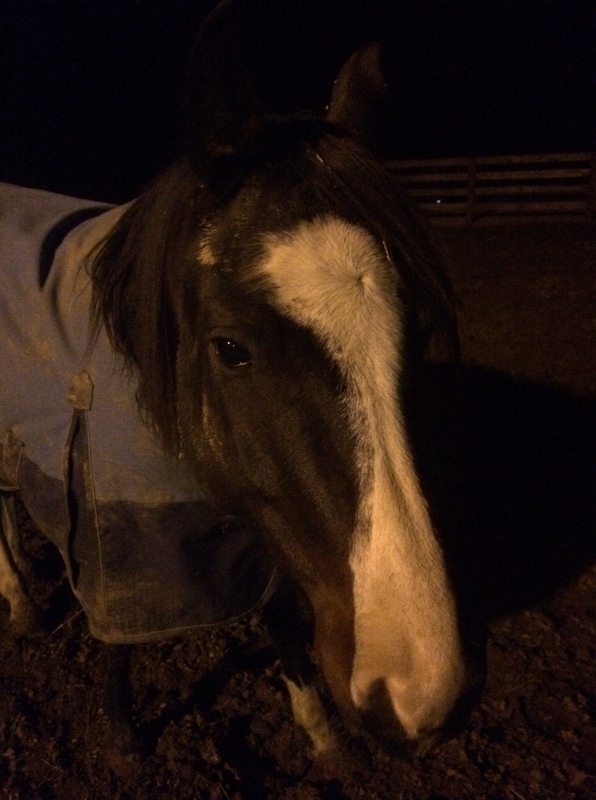 I probably won’t have any daylight by the time I get there but pony time is pony time, am I right? I’m ready for spring and more daylight so I can actually work on things when I get there? Did I fall off the wagon or what? Nibbles didn’t improve after the vet looked at her in October so I made the decision to just let her be a horse for a while. I feel like Sara leaving plus going into basically full-time training just blew her baby brain. This month, I’ve started doing some in-hand exercises just to test the gears, see if they’re rusty or still running a little bit loopy. So far, they seem to be in working order. In fact, Nibbles seems glad to see me when I come, especially when it means a long groom. I really can’t pinpoint exactly what happened in the fall but – knock on wood – I’m hopeful it’s behind us. I have a new plan. 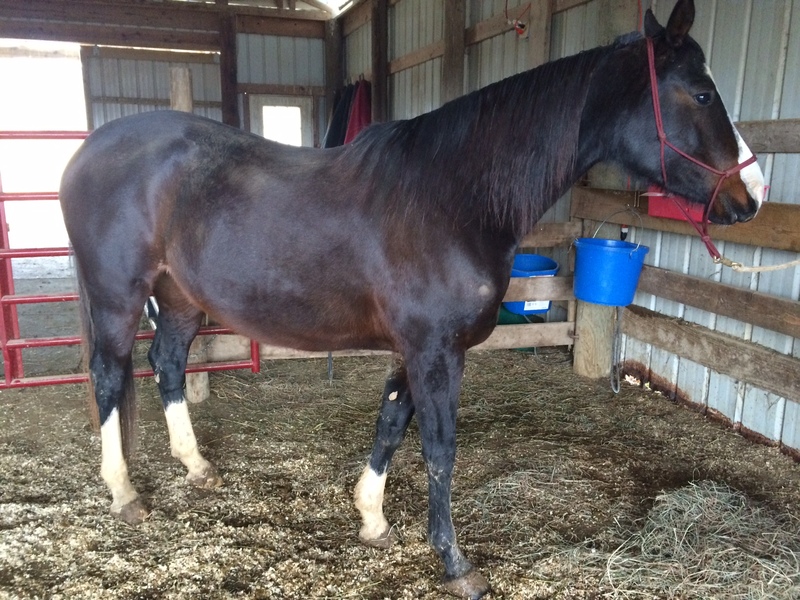 In either April or May, Nibbles will go up north to a well-trusted trainer friend of mine for pony bootcamp over 90 days. I’m pinching all my pennies to make it happen. The fiance and I will move up north for his school the first week of July so I’m hoping to time her wrapping up this bootcamp when we get settled in. She’ll be boarded about an hour and a half north of our new house so it’s not a big deal if she needs to stay to finish things up and – most importantly – for me to go up and take some lessons together. I think I’ve finally accepted that I will not be training Nibbles by myself. It would be a dream to be able to finish her myself but working downtown 40+ hours/week is the reality. For a while, I struggled with that because I felt like I was letting her down and, if I’m being brutally honest with myself, that training by someone else would be either sub-par or cruel. After coming to terms with the fact that I either put her into training or sell her – there is no other fair option to her – I feel better about my decision. It’s silly how we have to get to that point as horse owners, where we feel ok with a decision for our horses. 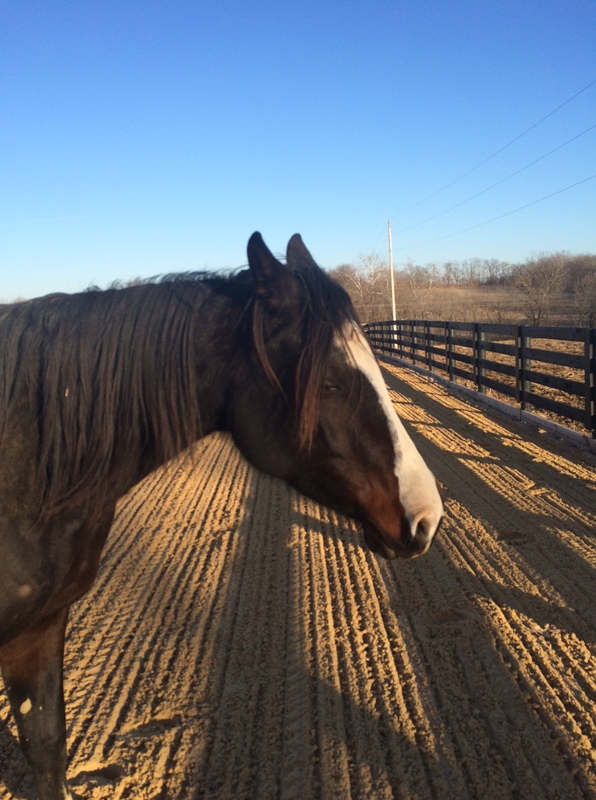 1) Get out to the barn, even if it’s just to groom her. Handling is handling and no one at this barn can do it for me. 2) Make sure she’s mentally and physically ready to go to the trainer’s. That means shots and the dentist in March but it also means making sure she has the lunging button firmly installed, tying isn’t an issue, being respectful of people’s space, clipping, bathing (ok, no bathing until April probably because of no hot water), etc. She’s been drilled on all of these things previously but I basically let her hang out in November and December so she’ll need refreshers. 3) Follow through and send her to the trainer for as much time as I can afford, certainly no less than 30 days but hopefully a full 90. 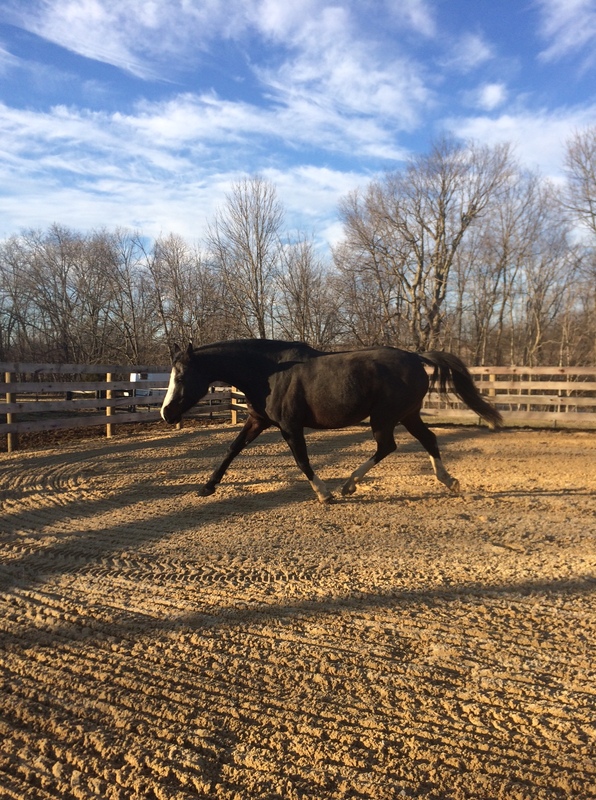 4) Come to the trainer’s as often as I can to not only see progress but so trainer can teach me and make sure I know how to not undo her work. Who knows? Maybe I’ll embrace the eskimo lifestyle and start riding her this winter again. We shall see!